I was extremely fortunate to recently be granted some question and answer time with a dearly beloved Monk and dear friend from the Blue Lotus Buddhist Temple. I wanted to ask some stimulating and provocative questions, and knew that Bhante Sanyatha would be extremely forthright and candid with me. But please understand that his responses represent only his thoughts and opinions, and do not especially align with other Monks or necessarily the Temple itself. I hope you find this discussion as fascinating and interesting as I did. Question – Why are you a Monk? Bhante: I am looking for some answers, like a researcher. Me: Can’t you accomplish this as a lay person? Bhante: I suppose, but a layperson has a lot of pressure from society that make it very difficult, like the pressure to be in a relationship with a partner. There are freedoms that are not as easily available to a lay person, as they are to a monastic. But society even has expectations on Monastics, like wearing these heavy robes in the 100 degree heat. And people may assume that it is a Monastics job to serve the community, but this too is not true. Me: But didn’t the Buddha create the idea of Monks so they could spread the teachings? Bhante: The original 60 monks were sent out in that way to teach, but that was 2600 years ago. As a monk today, how can someone teach if they do not know themselves, through their own direct experience. Just because you are a Monk, does not mean that you have wisdom. Question – Do you think it’s possible to completely eliminate suffering? Bhante: (long pause) Um, no. But I think you can change your attitude towards your life. For me, suffering is an optional thing. You create your own suffering. What you have to do, is to be mindful not to create it. But no matter what, the suffering is going to be there. Suffering just is, it’s there. It is just the way you relate, react to it, that determines whether or not you make your life miserable. Me: So, it sounds like it’s a waste of time being mindful because we cannot eliminate suffering? Bhante: No it’s not. Because it is our human nature to look for alternatives to suffering. The Buddha said as beings, we like happiness and do not like suffering. It’s just a human condition that we have. Being mindful is not wasting time, just a way to look at your life with a different perspective. Me: So then isn’t that a goal, to have less suffering and more happiness? Bhante: I don’t think so. It is just way to fully comprehend this reality. The point I want to make, is that once you fully understand the suffering, the reality, the nature, then I think you stop struggling with it. Me: So if we stop struggling, does that not mean that we suffer less? Bhante: Yes, but that doesn’t mean suffering goes away. Me: But isn’t one of the Four Noble Truths, the cessation of suffering? Meaning to eliminate suffering. Bhante: My take on that is, dukkha nirodha (mindfulness of suffering). The way of practice leading to the cessation of dukkha. So when something arises, if you do not have an aversion or attachment to it, then it just happens and you watch it. You observe it and you’re mindful. It’s a constant thing that is never going to stop until you die. It’s going to keep happening. People think that at some point there will be no more suffering. That is a bunch of baloney! Question – What is the best way to become liberated? Bhante: Freedom is a very difficult thing, because my life is very different. I do not have a Family or really strong relationships. This is the thing I see so many people struggle with. I see that sometimes one person is ready to let go, but the other party in the relationship is not. We don’t always have the complete authority to make all our own decisions. And I think that’s sad. The World has been institutionalized from religious leaders and political figures. So now we are caught up in so many rules and regulations, guilt and fear. So to be liberated takes a lot of guts, because you have to go against so many things in this society. And if you were to do it, you cannot be guilty or have any fear about this. It is a very difficult thing to do. Me: But even a single person has obligations and responsibilities, so what would it take to be liberated? To give up everything? Bhante: Yes. And even looking at myself, I too am caught-up in many things and am not able to be fully liberated. I have responsibilities and commitments. Me: So is being homeless, and having nothing, mean that you are liberated? Bhante: I don’t know. It’s the fear that comes about the future that holds us back. Fear of the future. Question – Is dana part of you nature? Bhante: No, I had to cultivate it. I studied it beginning as a teenager. It is not something inherent in us. We are not just alone, we have so many connections. Genetic traits, evolution etc. It is not something we are born with, but has to be developed. Me: If it’s good and wholesome, wouldn’t you think it is in our nature? Me: So why should we want to cultivate dana? Bhante: Because our nature comes from genetics and DNA that was not one of giving, but of self-preservation. Me: So what is the benefit of giving to others? Bhante: Because it feels good to me when I am giving and thoughtful of others. And it teaches me to let go. It makes me happy. Me: So it is, in a way, for the self. The mudita, gives you sympathetic joy when you give. Questions – Do you think there are other realms of existence beside this one? Bhante: I’m not a believer. I have not seen it, and it’s not tangible. If there is something like that, I am open to it. I don’t deny it, but I don’t believe it either. I just keep my mind open. Question – What are the benefits of eliminating desire? Bhante: To begin with, it eliminates a lot of suffering. But some desire is necessary. In Buddha’s teachings, he explains chanda. If we had no desire, we would not have any reason to get out of bed in the morning, to work or do anything. So you can have desire, but not with attachment. Desires should be wholesome, like getting up, working, getting food etc. You have to watch for the clinging. This is when desire produces the suffering. Question: Do you ever feel hatred towards anyone? Bhante: No, never. I do get angry, but never have hatred. I don’t build up my anger with stories. When I scan through myself, I can see no hatred toward anyone. There are people I choose to stay away from because I know it is not beneficial for either one of us. So I just choose to stay away from it. Me: But isn’t that wisdom? Bhante: Yes it is just better to stay away from it. Question – Is your loving kindness the same for all living beings? Question – Do you think a lay sangha (community) is important and beneficial and if so, why? 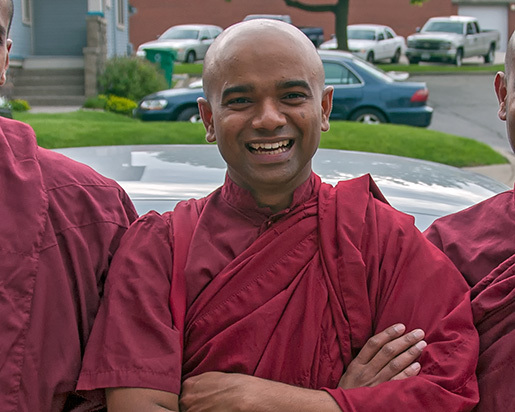 Bhante: I think we need the community, because it is our nature to support one another. That is the whole purpose, to help each other and be kalyana mitta, Noble friends. When we are on the path, we don’t always make the right decisions. And that’s when the Sangha can stop you and encourage you. Me: But can’t Sangha members give you unwholesome direction? Bhante: Yes, but then you don’t count them as Sangha. Sangha is people who are on a similar path with a similar goal. You need to understand which are Noble friends. Me: So how do you determine which ones are Noble friends? Bhante: There is a sutta where the Buddha explains not to judge a person just by looking at them. You must investigate more fully to see a person clearly. You need to know people better, so you see they have Right Intention, right purpose, and that they are on the right path. Discuss things with them to understand their wisdom. Me: And doesn’t the Buddha teach that we should only associate with people equal or higher level in wisdom and qualities? Bhante: Yes, but that doesn’t necessarily mean you can’t talk to all people and engage with them. But you really don’t know when you just see someone. It takes a while to find the right people, and ones who do not have their own agendas. In closing, I wish to deeply thank Bhante Sanyatha for his openness, wisdom and genuine compassion. What a very special gift he gave me today with this intimate discussion. I hope you enjoyed it, and find it of some benefit.